Is Blood Really Thicker Than Water? | Then there were three..
"Family isn't always blood. It's the people in your life who want you in theirs; the ones who accept you for who you are. The ones who would do anything to see you smile and who love you no matter what." I am pretty sure that everyone has heard the proverb "blood is thicker than water" which implies that relationships with family members are more important than relationships with friends. For a lot of people, this may well be true. I know a lot of people who have fantastic relationships with their families; everyone is nice to each other and respects the others opinions. 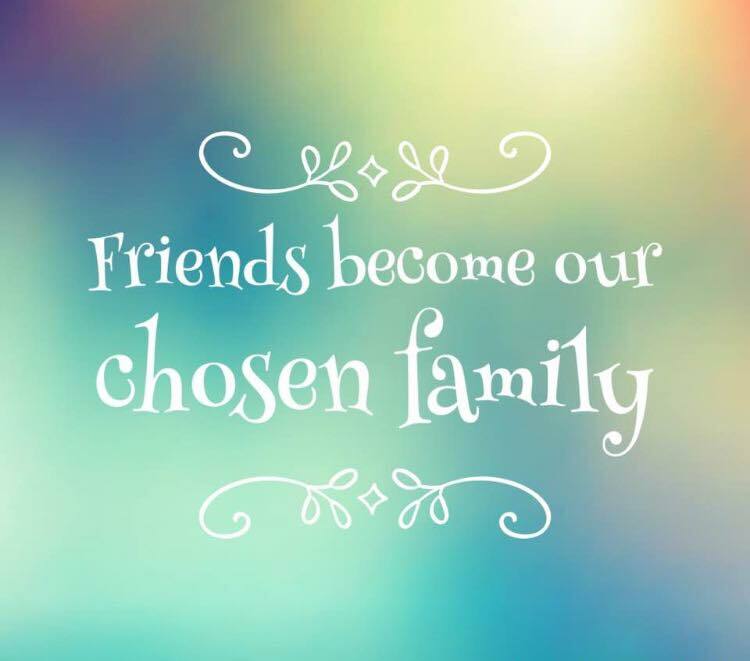 However, there are also a lot of people who do not get along with members of their families, those who see their friends as their chosen families rather than those related by blood. The later is certainly the case for me. Not many people know that, essentially, I have been estranged from my mother, sister and the rest of my mothers side of the family for around four and a half years now. They have never met my husband or my daughter and I'm glad of that, as controversial as that may sound. The relationships I had with my mother and sister were toxic and harmful - looking back, I wish that that I had walked away from them sooner. I always tried to figure out why I was treated differently to my sister; the only reason that I can think is because I was a 'daddy's girl' and my mother didn't like that. As soon as I started working I had to pay rent, which was fine. My sister however, was not expected to pay a penny when she had a job. When I passed my A Levels there was no "congratulations" or "well done", just complaints that I had decided to continue on to University and she did not want to help with contributing, yet when I offered to take out tuition loans, this wasn't good enough either and I was met with more complaints. When my sister dropped out of college twice and did nothing, she was the "sensible" one and praised for her decision, And we can't forget the time where my sister made false GBH allegations against me and I was arrested. The police found the evidence to prove that all allegations were false and I was released with no charges or warnings. I chose not to take action against my sister for my mother's sake. Yet when I walked out of the police station I was met with verbal abuse from my mother about how the whole situation had been my fault. The final straw was in the summer of 2012 - I woke up in hospital with a head wound and no idea on how I had ended up there. As my mother was down as my next of kin, they had rang her to come to the hospital. She refused. She didn't ask the nurse what had happened, she just simply responded with "I'm not coming. Tell her to ring her father." Even the nurse commented on her response and branded it "shocking". Within 15 minutes of my father being called, he had left work and was at the hospital. I had Facebook messages sent to me, the majority of which were ignored and most of the content I don't wish to divulge. After not seeing her for two and a half years, she appeared in a coffee shop that I was in next to my work - I was around 7 months pregnant at the time and I just walked out. The second time I saw her was only a few months ago in a city around 45 minutes from my home. I was with my husband and daughter at the time and was about to step into a lift when I realised she was standing inside the lift. Again, I turned around and walked away. I suffered from the toxic relationships for years and there is no way that I will let my daughter be exposed to it. My daughter has two sets of grandparents who love her unconditionally and my dad's partner is more of a mother to me than my own ever was. 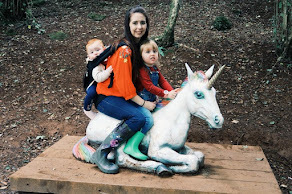 In some ways I am glad of how things were as it has changed me and shaped me into the mother I want to be; one who supports all of their children's decisions and one who treats each of them equally. To put it bluntly, the mother she never was. Some people may think the way I speak about this is too harsh, but until you are in that situation yourself then you cannot comment. Some people may say "forgive and forget", but I do not want to. I shouldn't have to forgive or forget anything I ever experienced from her. I'm glad of the majority of my family who are around me now, along with my friends who are like the brothers and sisters I never had. 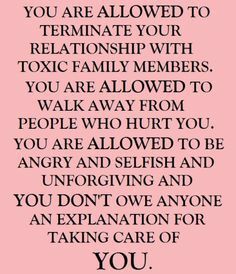 So, for everyone with a toxic family member; let them go. Blood doesn't mean anything. If anything, I truly think that those who are related to you will push further in trying to upset someone, as they are secured with the feeling that they can get away with it as you can't "escape" from the relationship. I promise you that if you want to, you can. You will come out better for it. I know exactly how you feel, I cut my father out of my life for the same reason. Blood isn't thicker than water, and you are best leaving your daughter out of such a horrible environment. I know I am glad my children won't ever know my dad.